Ornamental fences are an amazing way to spruce up your yard. There are many different kinds of fencing that you can have installed around your home. We’ve talked a lot about vinyl fences, wooden fences, and dog fences, but what about the people who are looking for something a little classier? An ornamental fence is the fencing solution for those of you looking for something that will bring beauty and harmony to your back yard. Ready to learn more about how an ornamental fence can add majesty to your home? Let’s dive in. Ornamental fencing can come in many different forms. When you choose your new fence, you need to think about both the aesthetic value and the utility of your new installation. 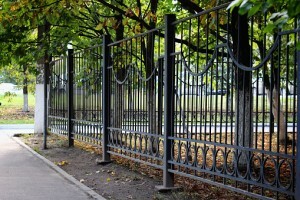 Ornamental fencing is usually cast iron, which is exceptionally sturdy. Thus, you can enjoy it for more than its looks, though it will be good for that. The utility of your ornamental fence will come down to your personal needs. Do you need a fence for your whole property? In that case, you can add a gate. If you need something smaller for your garden, then you should look at smaller fencing options. This may seem like simple advice, but it’s important to think about these things when you’re investing in a new fence. Raise your property value with an ornamental fence. Fencing offers security and beauty, both of which are very valuable to potential buyers. Even if you don’t think that you will be selling your home any time soon, making sure that your property looks beautiful is always a good idea. You may need to move suddenly; the future is unfolding anew every day. Choose the best ornamental fence for your home in Northern Virginia. Since 1955, our professional team has designed and installed fences to meet the needs of a wide array of clients: residential, commercial, and government. We pride ourselves in installing high quality fences at affordable prices for the people of Manassas, VA. This entry was posted on Friday, July 1st, 2016 at 8:16 pm. Both comments and pings are currently closed.